The answer, in all its simple, slow brewing, tangy tasting glory was to start a sourdough culture. Mulchy, brown and bubbling away in a little kilner jar, it was hardly going to provide the glamour shots I’d originally intended for this first birthday post with my multi-tiered celebration cake. But it was exciting in its own way – an acknowledgement of how far I’ve come since that very first wholemeal loaf emerged from my oven and the start of something new. Sourdough is one of those things that has achieved a strange sort of cult status amongst the uninitiated. From the outside, the world of wild yeast looks like an impenetrable club – a collection of incredibly skilled bakers who tend to their cultures with expertise and insider knowledge, who work magical alchemy on their dough by making it rise without the aid of commercial yeast. But it’s really not as scary as you think. That’s not to deny the skill it takes to produce an incredible sourdough loaf – there are some amazing breads and bakers out there with whom I wouldn’t even begin to try and compete – but at a basic level sourdough baking is a simple, natural and something people have been doing in the comfort of their own homes since ancient times. If the Sumerians of 2800 BC could master the art of sourdough baking, I’m pretty sure any twenty first century baker with access to such a multitude of ingredients and advice is more than qualified to give it a shot. If you’re not familiar with sourdough, essentially it’s a polyculture of yeasts and bacteria cultivated in fermented flour which contribute to the leavening process of your bread. It produces a complex loaf unlike anything you can make with commercial yeast, with a wonderful taste and texture. Tangy, moist, dense, nutty and chewy with strong wheaten notes and little aerated pockets running through the crumb, sourdough also tends to have a lovely crunchy crust. And it not only delivers on flavour, this particular process of fermentation both releases nutrients from the grain and creates new ones, as well as increasing protein and synthesizing vitamins. What’s not to love? I started my culture at the end of February and last weekend I baked my very first loaves. Without the confidence that comes with a packet of commercial yeast, I was worried about getting a good rise, but all fears were abated when the dough had doubled in size with evidence of lots of lovely little bubbles throughout. I shaped the dough, then left my first loaf (made with strong white bread flour) to prove overnight. In hindsight, I left it a little too long as the next morning it had flattened and spread slightly thin on my tray. The resulting baked loaf had a lovely taste and texture, but could have done with being a couple of inches taller. 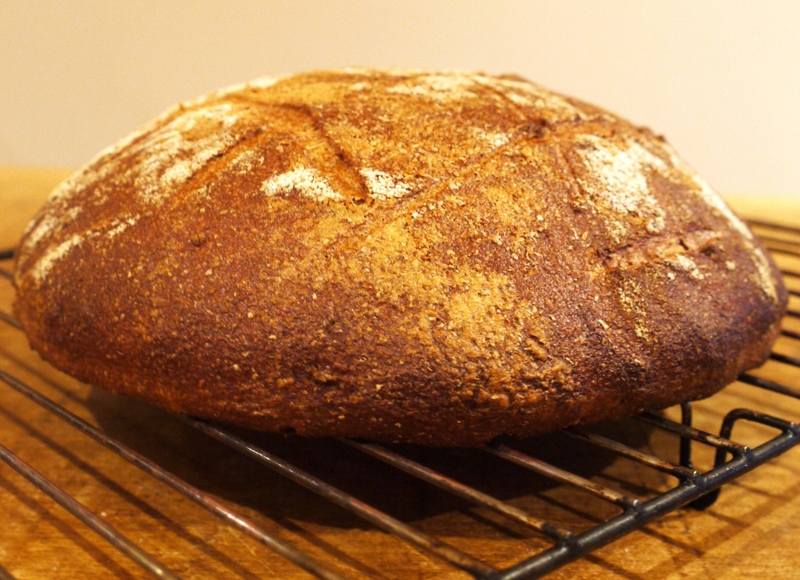 The second loaf I baked was 100% wholemeal using a recipe I found on the Shipton Mill website. This time I proved the dough in a colander lined with a well-floured tea towel (thanks to some advice on Twitter) and it retained a perfect round shape as it rose. The loaf had a beautiful taste and texture – smooth, nutty and slightly sweet with a crunchy crust and flavour almost reminiscent of a light rye bread. I’ve been eating it every day for lunch (the white loaf is long gone after being demolished at breakfast on Sunday by four hungry house guests) and the simple joy of unwrapping those homemade sourdough sandwiches has been more than enough to get me through the working week. As I’m still experimenting with sourdough recipes and very much a novice, I’m not completely comfortable sharing my recipes with you yet. If you’re itching to get going with your own culture, have a look at the links in my sourdough starter post. And for recipes once you’ve got that starter going, take a look at the wonderful resource that is Susan Tenney’s Wild Yeast Blog. 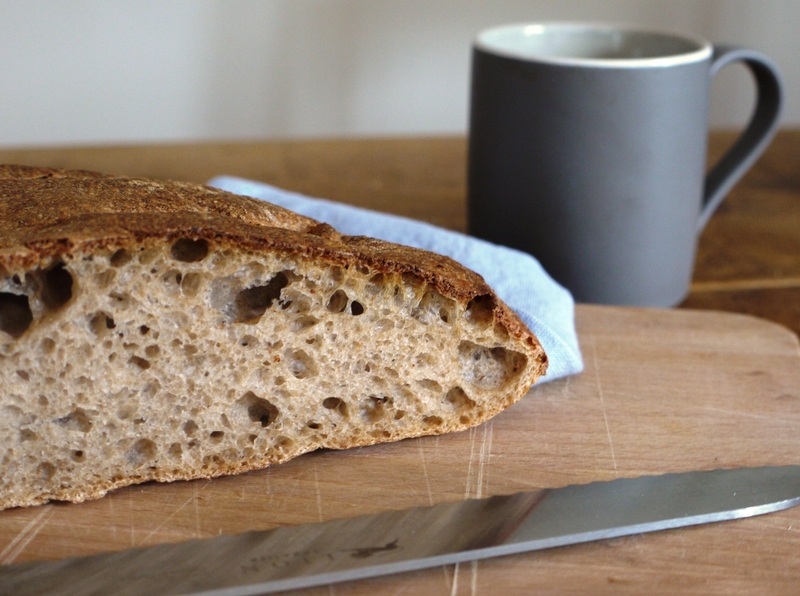 In the meantime, I thought I’d share some of my favourite ways to enjoy the very best thing about sourdough bread: eating it. And the photos are wonderful…I can almost taste it. Feeling very inspired – many thanks for the post. Liked your post about starting the sourdough culture and great to see this first – delicious looking! – loaf. I like your different ideas for serving bread too. Sourdough is so satisfying… need to get Pete to wake up Levi our Levain and make some more soon. A FANTASTIC resource for those learning to make bread is a friend’s blog, Azelia’s Kitchen, would recommend you check it out, she’s a real stickler for understanding the reasons behind each success or failure and the result is an amazing resource for the serious baker. Oh this looks so yummy. I love sourdough but certainly not brave enough to make it at home! Rachel – thank you so much, and so pleased the post has inspired you! The Single Gourmet & Traveller – the recipe I used made quite a lot of bread so I thought it was a good idea to include suggestions for eating it up! Kavey – I do follow Azelia’s blog. It’s absolutely fantastic, although I’m a slightly more relaxed baker than she is and haven’t quite got into all the temperature taking and different flour testing that she does. Maybe one day…! Heather – it did! Baking bread just smells amazing. Sophie – you should give it a go, I promise it’s not that hard! Cue drum roll……………well done you. You should be dead proud of yourself. Not an easy task and it turned out fantastic. Next task? !! It really is beautiful. You know, in your honour I might buy myself a new kilner jar and start my own culture. I’ve never made sourdough bread, but I’d really like to. Nice one, Loaf! A very happy blog birthday to you! And congrats on the sourdough starter… I am still a little nervous of plain old yeast, so unlikely I will be goibg down that route any time soon LOL!! Happy First Birthday!! Louis and I once ventured into making our own sourdough… it was NOT a good experience although, to be fair, we never actually made the bread.. we just let the sourdough get totally moudly on the counter… too disgusting!! While He Was Out – thank you! Frugal Feeding – you should! You don’t even need a kilner jar – a bowl would do just as well. Em – haha, yep I’m slightly nervous about mine going off. Hopefully if I keep tending to it, it will be ok! Congratulations on your first loaf! Welcome to the club, I make sourdough from my starter once a week, it’s wonderful bread and as you get better at it and your starter matures the bread will become better and better! Well done! I have managed foccacia and fourgasse but that is about it! I am not the greatest of kneaders! 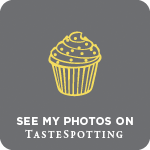 The photographs are excellent – the toast one made me drool and it is not breakfast time yet! Delicio8 – everyone says it just gets better with time…can’t wait to get baking again this weekend! Nic – thank you, and you should! Zita – you should, I’m sure you’d absolutely love it. Your loaf looks fantastic – a perfect sourdough. And it’s a very fitting way to celebrate your first blog birthday. Well done, I have still not been brave enough to venture into sour dough. The bread looks great. I made a sourdough a couple weeks ago at my baking lessons and it was so good. Your’s looks pretty divine. Happy anniversary! Delicious! Your bread looks great. And thanks for the inspiration. I need to challenge myself a bit in the baking department. It looks lovely! I would really like to try this too. Congrats on your first loaf! It is gorgeous. I’ve been wanting to make one for quite some time but I haven’t been able to muster up the courage to actually do it just yet. Maybe when summer hits and I have some downtime. 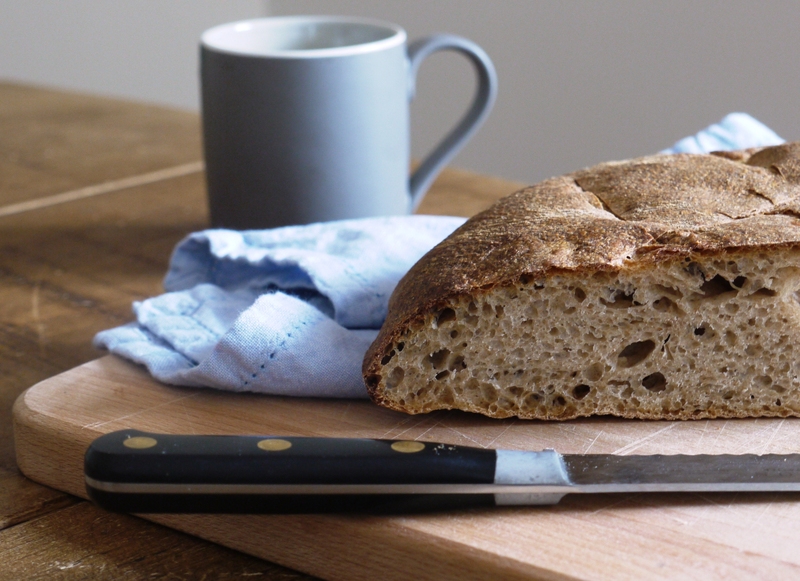 Daisy – thank you, I’m wondering what I did before I had homemade sourdough in my life! Choclette – thank you 🙂 I’m actually eating a new batch of sourdough as I type and it’s even better than the first one. Yum. Things We Make – you should, I promise it’s not that tricky. Cafe Terra – it’s my first sourdough, not my first ever loaf! (that was a bit of a disaster…) but thank you! Laura – thank you. I’d like to try a rye starter next – so many different things to try in fact! Sylvie – you’re absolutely right. 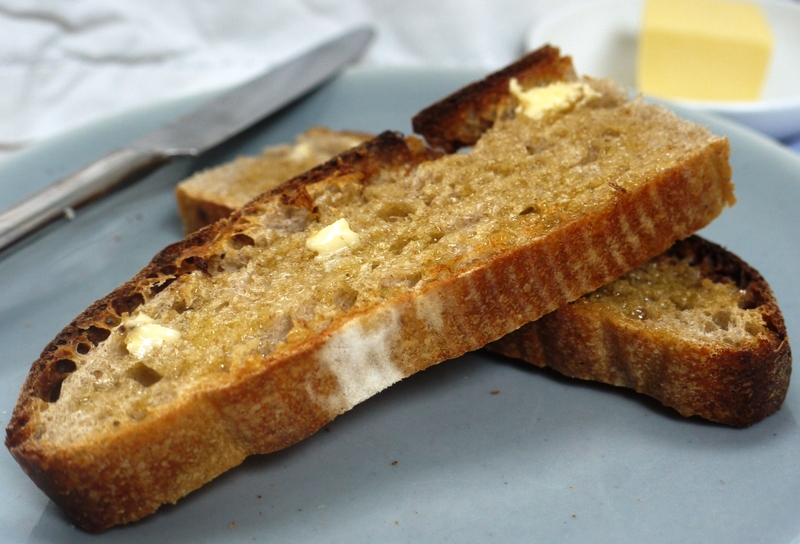 Homemade toast and salty butter = bliss. I LOVE my sourdough starter. it’s my baby. My first loaf turned out alright, though it wasn’t fantastic, but I thought it was hte most brilliant bread I ever tasted. that unmistakeable tangy flavour that’s almost unique to youe oqn sourdough baby! ah, can’t wait to see more! Lovely post. 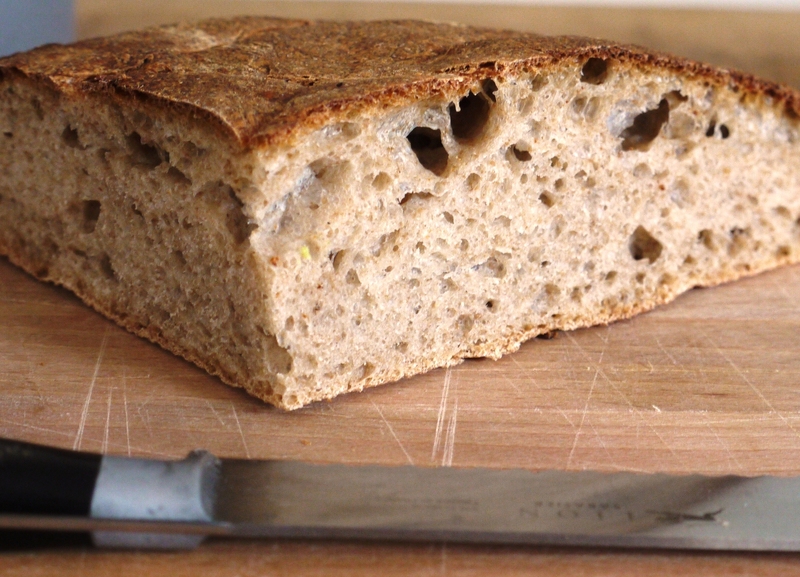 I use a sourdough recipe from Richard Bertinet’s book “Crust”. Vivien – yep, I’ve got the Richard Bertinet book – he’s such an inspiration. Ai Love Baking – ah, thank you! Do give it a go – I promise once you’ve made the starter you’ll wonder why you were so scared of it!